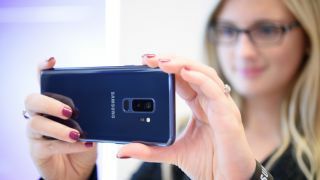 Samsung has finally unveiled its Galaxy S9 and S9+ smartphones, with the announcement confirming the expected strong focus on the devices' imaging capabilities. Billed under the strapline 'The Camera. Reimagined,' the Galaxy S9 and S9+ compete with a raft of devices that also pack impressive camera systems, such as the Huawei Mate 10 Pro and the Google Pixel 2. The Galaxy S9 sports a Super Speed Dual Pixel 12MP camera on the rear, with Optical Image Stabilisation. This results in images measuring 4032x3024pixels as standard, although a range of other aspect ratios and lower resolutions can be chosen. The S9+, meanwhile, has a dual-camera design on its rear, with wide-angle and telephoto lenses. The aperture is variable on both models' rear cameras, mechanically changing between f/2.4 and f/1.5 – much like on Samsung's flip-screen W2018 phone that was launched a few months ago in China. In practice, the camera will use f/2.4 when lighting is good (over 100lux, according to Samsung) for maximum depth of field, and will open up to f/1.5 in darker conditions to enable enough light to get through for a good exposure. According to Samsung, this wide aperture means that the S9 and S9+ end up capturing 28% more light than the previous Galaxy S8. Not surprisingly, Samsung also claims that noise reduction has dramatically improved over the S8, with Multi Frame Noise Reduction performed in particularly dark conditions leading to images with 30% less noise than before. Around the front, both the S9 and S9+ sport an 8MP camera with a f/1.7 lens, and the company has also revised the user interface so that you navigate between shooting modes differently. Slow-motion capture is also on hand, with the Super Slow-mo feature capturing footage at 960fps in HD quality. Cleverly, by placing the subject within a box on the screen, the S9 and S9+ will only start recording once the action happens, saving long periods before and after the event from being recorded. The resulting footage can then be looped or played in reverse, and even saved as the lock screen. Elsewhere, the S9 and S9+ provide all the kind of control expected for a high-end smartphone, from the option to capture images in a Raw format to control over white balance, shutter speed and ISO. Users can also shoot in an HDR option and use AF tracking to keep a lock of moving subjects. The front of each device is largely occupied by the latest evolution of Samsung's Infinity Display. This now pushes further out to the bezel around it to make for a more immersive experience, measuring 5.8in and 6.2in on the S9 and S9+ respectively. Added to this are stereo speakers and Dolby Atmos sound. Other features include a headphone port and a 3000mAh battery with wireless charging (3500 mAh on the S9+). Both camera are also protected against dust ingress and waterproof to the IP68 standard, and can have their memory expanded to 400GB through a microSD slot. The Samsung Galaxy S9 and S9+ will be available in the familiar Midnight Black and Coral Blue finishes, as well as a new Lilac Purple option, and pre-orders will start later today. The phones will be available for sale on 16 March. In the UK, the S9 will be priced at £739 while the S9+ will retail at £869.